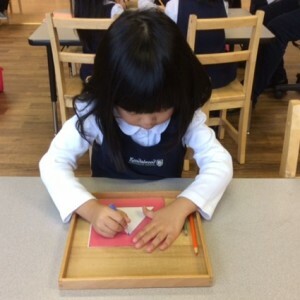 The Montessori child works through many stages in the pursuit of learning to write. Writing skills are separate and distinct from reading or language development in Montessori education. A specific set of materials are involved in learning to write, primarily Metal Insets, Sandpaper Letters, and the Storybook Alphabet. A child will start to learn the sounds of the letters using Sandpaper Letters. This material is made up of sand glued to cardboard in the shape of the sounds of the alphabet. The material is both sensorial and tactile, encouraging the child to learn through touch. Sandpaper Letters are lightly traced with two fingers to promote muscle memory of the written letter for later movement of pencil on paper. Letter sounds are used instead of letter names to prepare for reading. Once a few sounds are taught, the Storybook Alphabet is presented. Sounds that the child has been working on are presented again in a sequence that makes sense – for instance “c – a – t”. While learning which sounds work together, preparations are being made for grammar and vocabulary work. Though separation of consonant and vowel is made within the materials by colour, little attention is drawn to the differences at this stage. The preliminary work is being categorized by the child’s mind naturally. You will have noticed that although the child has worked with two materials in the preparation for writing with the Sandpaper Letters and the Storybook Alphabet, he has not yet put pencil to paper to form these sounds. This part of the process begins with Metal Insets; metallic geometric shapes that are traced in one colour, while curved lines of varying width are traced inside, in a second colour, from left to right. This material builds control, fine motor movements, and muscle memory learning to write from left to right. It is only once all three of these different materials are working in tandem and the child is comfortable with several sounds, can control the pencil when completing a metal inset, and can build sounds into words, that the child is then given a pencil and paper to begin writing. At this point, forming the letters on paper seems natural and practiced, even though it may be the very first time the child has ever written. Developing writing skills is an intricate process for students and takes time. 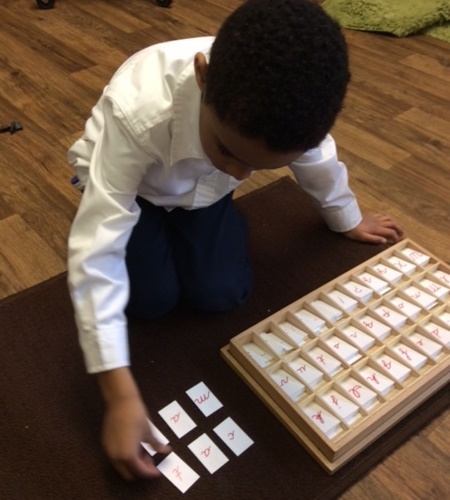 Montessori materials help children make the necessary connections and build the skills required to achieve proficiency with confidence at their own pace.